Campbell Clinic is recognized around the world as the leading authority in the field of orthopaedics. Its more than 40 orthopaedic specialists collectively author Campbell’s Operative Orthopaedics, the definitive reference for more than 1,800 orthopaedic procedures. Despite Campbell Clinic’s global recognition, many Memphians aren’t aware that the world’s best orthopaedic specialists are right here in town. Campbell Clinic asked inferno to help the clinic continue to position itself as offering world-class specialists. Because women most often drive health care decisions, the campaign needed to resonate with women. 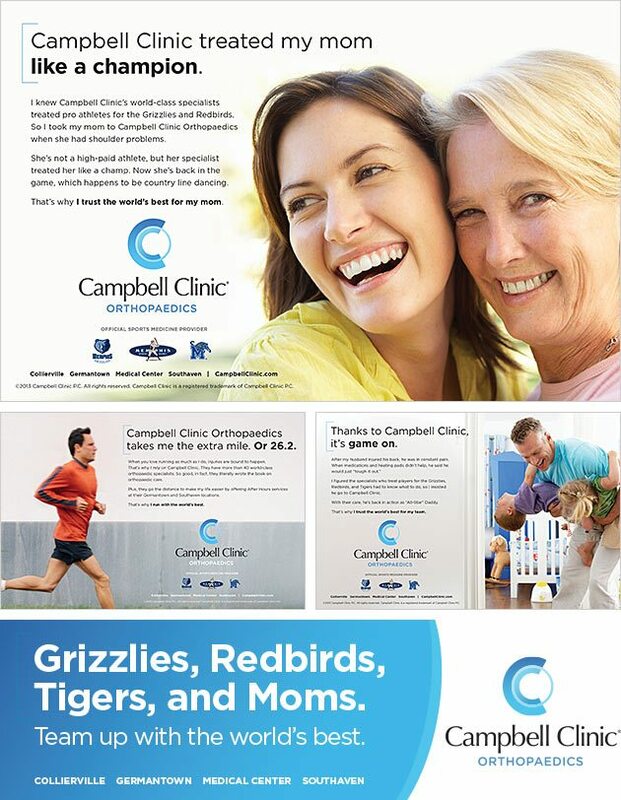 Secondarily, Campbell Clinic wanted to get more mileage out of its role as the official sports medicine providers for the Memphis Grizzlies, Redbirds and Tigers. inferno created a multi-pronged marketing campaign to promote Campbell Clinic as the official orthopaedic provider for families across the region. The campaign includes outdoor boards, radio spots, print ads and television spots. All the components wrap in the message that people, especially moms, are choosing the “world’s best” for their teams.